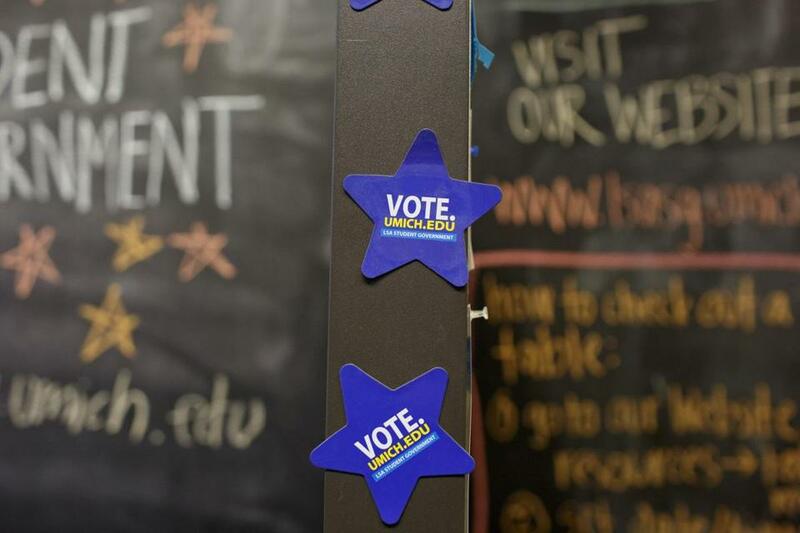 Student government voting magnets in Mason Hall during a “Bagels and Ballots” event at the University of Michigan in Ann Arbor last month. NEW YORK — The University of Michigan has a long tradition of politically active students, dating back to the Vietnam War protests. That is why Edie Goldenberg, a political science professor there, was shocked to learn the percentage of students at the school who cast ballots in the last midterm election: just 14 percent. Goldenberg has now set a goal for this November’s elections of more than doubling student turnout. And the university itself is getting behind the effort by challenging its Big Ten football rivals to a competition to see which school can get more students to vote in the midterms. College campuses are often seen as hotbeds of political engagement, with controversial speakers routinely kicking up loud protests. But abysmally low turnout among young people has long been a hallmark of US elections, particularly in midterm years. Data suggest that only 18 percent voted in 2014, compared with about 37 percent in the overall population. Now a growing number of universities are using their institutional power to increase student turnout on their campuses, spurred by a desire to develop students into better citizens. And schools like the University of Michigan are armed with data showing them for the first time which kinds of students are voting and which are not, so they can target their efforts and measure which strategies work. The new emphasis on voting — among a population that tends to vote Democrat — comes as the nation gears up for a high-stakes midterm election. It is unclear whether the efforts to increase student turnout will impact the nation’s political map. Among the students who vote, many cast absentee ballots for districts where they grew up. But about three dozen House races considered competitive this year were won in 2016 by margins smaller than the number of college students living in the district. Representative Darrell Issa, Representative of California, won by 1,621 votes in a district with more than 51,000 students. More than half attend the University of California, San Diego, which has set up a student-organized “voter access” committee to push turnout in the fall. Representative Claudia Tenney, Representative of New York, won by 15,178 votes, a number smaller than the student body at Binghamton University, which is giving out prizes — such as foosball tables or television sets — to the residence hall that registers the highest percentage of voters. And Representative Stephanie Murphy, Democrat Florida, won by 10,456 votes in a swing district that is also home to the University of Central Florida, with 66,000 students. That school has set a goal of achieving a 70 percent student voting rate by 2020. School administrators involved in raising student turnout insist that their efforts are not focused on any one election or political party. Instead, they cite an urgent need to combat a troubling decline in political participation. Voter turnout in the United States has declined since the 1960s for nearly every age group. Young people have the lowest turnout rates of all because they are more transient and have not yet established the habit of voting, said Kenneth R. Mayer, a political-science professor at the University of Wisconsin Madison. “They don’t have concerns of property taxes, schools, and other things that make older people go to the polls,” he said. The likelihood of voting increases steadily with age, until about 80, when illnesses begin to prevent habitual voters from casting a ballot, he said. Young people who do vote tend to favor Democrats. According to a Pew Research Center poll, 58 percent of 18- to 25-year-olds either identify as Democrats or lean toward the Democratic Party. That is the reason some conservatives complain when students flock to the polls, especially in rural places where students outnumber longtime residents. Efforts to bolster student turnout have been aided by a new national study that analyzes voting behavior on campuses across the country. For the first time, schools can get detailed data on how many of their students cast a ballot, either locally or absentee, thanks to the National Study of Learning, Voting, and Engagement, put out by researchers at Tufts University. The study aims to assess how well schools are doing at preparing students to be active citizens in a democracy, said Nancy Thomas, director of the Institute for Democracy & Higher Education at Tufts, who oversees the study. The study, which matches enrollment records with voting records, began in 2013 with a modest expectation of getting a few hundred colleges to participate. Today, it includes voting data from more than 9 million students on 1,100 campuses in all 50 states. Identifying information has been removed from the data to protect students’ privacy.